In the late ‘90s, MadTV was Fox’s answer to NBC’s Saturday Night Live, and while it never spawned the numerous movies from its skits that SNL begat, it did introduce the world to, among others, Keegan-Michael Key and Jordan Peele, who’d later go on to create the hugely popular sketch show Key & Peele. Keanu is their debut feature, a parody of John Wick and other revenge movies. While Key and Peele may not have been cast members on Saturday Night Live, Keanu has all the trademarks of an SNL movie adaptation — none of which do it any favours. 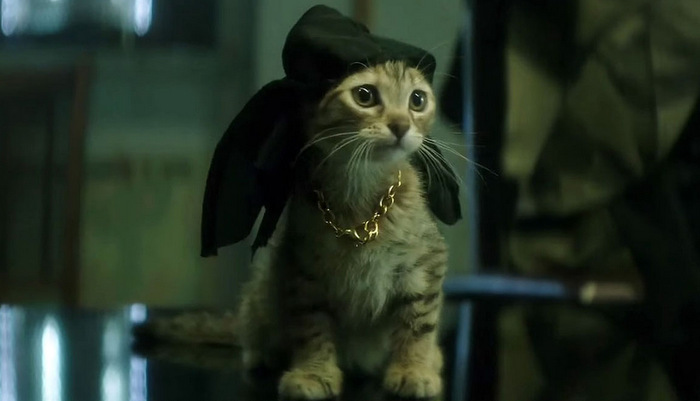 In the wake of a break-up, Rell (Peele) is searching for a reason to go on, and finds it in the form of a kitten that shows up on his doorstep at his lowest moment, which he names Keanu. When Rell’s house is broken into by gangsters and Keanu is stolen, Rell teams up with his cousin Clarence (Key) to rescue him. Once they find Keanu in the clutches of the ruthless Cheddar (Method Man), they pretend to be notorious killers to get in tight with the boss. Going undercover, Rell and Clarence (or, as they pretend to be, “Tectonic” and “Shark Tank”) find themselves consistently having to explain away their fear of guns, their aversion to violence, and their love of George Michael’s greatest hits. It’s really funny the first scene they have to bluff their way out of a tight spot. It’s still mostly funny the second time. By the fourth or fifth scene of the same joke, though, it’s mildly amusing at best. Key and Peele’s background in sketch comedy is achingly apparent here and it’s their downfall. What’s clever enough to easily support a five-minute sketch turns repetitiously dull and disappointingly simple when spread over almost 100 minutes. Both Keegan-Michael Key and Jordan Peele are naturally funny, not just individually but in particular when riffing off of each other, which really helps Keanu more than it deserves. Even diehard fans of the duo, though, will find themselves wishing for more for them to work with here. For all the lessons MadTV and Key and Peele took from Saturday Night Live, it’s a shame Key and Peele didn’t learn that more is always less. Bargain bins are littered with surplus DVDs of Superstar, It’s Pat, The Ladies Man, and MacGruber, all of which only worked in five-minute doses. Expect to come across unwanted copies of Keanu amongst them by this time next year.